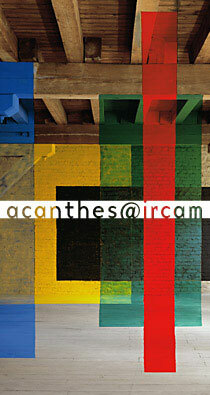 IRCAM will initiate, in June 2012, a new event in Paris, both an academy for creation and an international festival. A union of education and creation, acanthes@ircam places music in the field of the “arts of time” (theater, dance, video). How is a temporal plot where the composer and performer are both decisive figures created? Composition workshops and signature group projects (In Vivo Danse, In Vivo Théâtre), transmission and experiments through apprenticeship (master classes), playing instruments and using technology, circulation of surfacing works at the very heart of a new European network supported by IRCAM, Ulysses, escaping historical limits and disciplines: these are the fundamental elements of this federating rendezvous. This first edition of acanthes@ircam is supported by several partner/co-coproducers: The CENTQUATRE, The Centre Pompidou (Spectacles vivants), and The Orchestre philharmonique de Radio France. The Ensemble intercontemporain, fully engaged in the academy’s realization, will be the academy’s permanent associated ensemble. acanthes@ircam will also rely on the support of several important players in the domains of culture, higher education, and research: The Conservatoire national supérieur de musique et de danse de Paris, The International Ensemble Modern Academy, The Council on International Education Exchange (a network of American Universities), The Comédie de Reims, les Bouffes du Nord, ProQuartet, and Charleroi Danses. acanthes@ircam offers a new context to the academy founded in 1977 by Claude Samuel: that of a multidisciplinary academy in action. The composition workshops, taught in 2012 by Philippe Manoury, Luca Francesconi, and Thierry De Mey, enabling young composers to work with leading professional performers. New alliances in the performing arts scene will be made possible with the In Vivo Théâtre and In vivo danse workshops. The essential role of interpretation is reinforced through master classes where the converging perspectives of the repertoire and creations are drawn: Christiane Oelze for voice, Pierre-Laurent Aimard and Sébastien Vichard for piano, Pierre Strauch for chamber music and cello, and the Arditti quartet. In the same vein, Thomas Adès will lead a workshop on the contemporary repertoire with young musicians from the International Ensemble Modern Academy (IEMA). From the “arts of time” to the “time of the performer”, through a multitude of dissimilar aesthetics, acanthes@ircam takes on a new school of the perceptible.